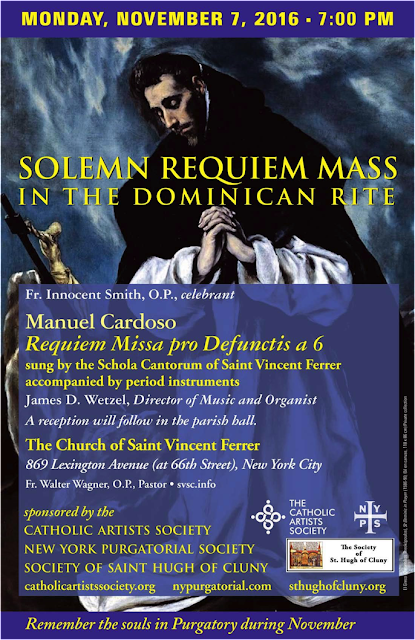 The Catholic Artists Society will have its annual Solemn Requiem Mass for deceased family members, friends, and fellow artists, on Monday, November 7th, at the beautiful church of St. Vincent Ferrer in New York City. The Mass is co-sponsored with the New York Purgatorial Society and the Society of St. Hugh of Cluny. The Schola Cantorum of St. Vincent Ferrer, accompanied by period instruments and conducted by James Wetzel, will sing Manuel Cardoso’s Missa Pro Defunctis a 6. A reception will follow in the parish hall. Detailed information in the poster. Once again, it is a very encouraging thing to see not only the continual and growing interest in the Dominican liturgy, but also the cultivation of the rite in company with such excellent music.